This is the "after" picture that goes along with the cake below. 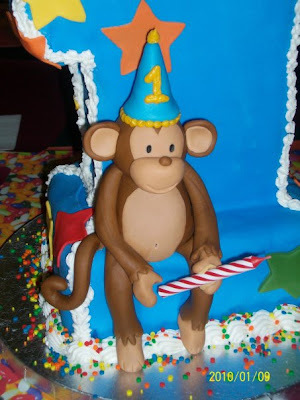 I can't believe our little monkey man is one! It seems like just yesterday I made his baby shower cake (the baby in the bathtub) and now I'm making his 1st Birthday cake! Happy Birthday to you, Joshua- your auntie loves you!!! 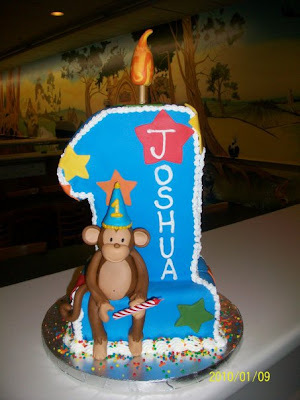 This cake was made for my nephew's 1st Birthday. Close up of the monkey handmade in all fondant. We call him a little monkey- so this guy had to be included! This picture shows just how big the cake actually was! I also made a basketball smash cake for him. He loves balls and was trying to reach for the ball cake the entire time. At first, he had no idea what to expect. He didn't realize he could actually eat the ball and when he went to grab it he was so confused! His auntie had him taste a little bit and after that, he dug right in! This was one of my biggest cakes to date. It was made for my Gram's surprise 70th birthday. I had been thinking about the theme for a while and wanted to celebrate her and our family. She is an amazing woman and her and my Papa have done such an incredible job of raising their three daughters. Gram is the glue that has held our family together and I'm so happy to have been able to honor her with this cake. You can see the detail in the top that included a leaf for everyone in our family- including my grandparent's dog! The top was all edible and covered in buttercream. Close up of the trunk- made with all cake and covered in fondant. Here we are trying to cut the giant cake! This cake was made for my sister's boyfriend. He's a bird enthusiast and his favorite bird is the gray catbird. you'll be able to see the detail in the wings, etc. Two tiered cake made with 8 and 6-inch layers covered in fondant. All details are handmade and then sprayed with a shimmer to give it a softer look. Did someone order a baby? This two tiered cake is made with 8 and 6-inch tiers covered in fondant. It was made for my supervisor's baby shower. navy, white and mint green with little turtle accents- so cute! The cake was sprayed with a shimmer to make it shine! James the Red Engine was made for Justin's 5th birthday. Last year he ordered the Thomas cake that is on my site too. This is all cake! The following two cakes are Hollywood themed. Both are covered in fondant with handmade fondant details. This double layered 10-inch cake was made for my little cousin's 10th birthday. She designed the cake herself and had it at a Roller Rink- how fun! This is a double layered 10-inch cake with a sun cake on top. The best part is that it was requested by a 5 year old! The planets are all made of fondant. These were four separate cakes made for a Boy Scout event. All pieces were hand-drawn on fondant and added to the cake. of the birthday boy's level in karate. with another one of his favorite activities.